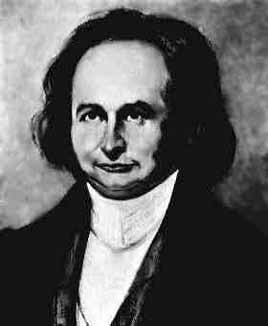 Karl Jacobi (1804-1851) did important work on elliptic functions, partial differential equations, and mechanics. He excelled at formal manipulations, being rivalled in this regard only by Euler and Ramanujan. Jacobi was the son of a prosperous banker, and remained independently wealthy until the family fortune was lost in 1840. He showed great talent in both languages and mathematics from an early age, and pursued both at the University of Berlin. Eventually he chose mathematics, and obtained his doctorate in 1825; his thesis was on the subject of continued fractions. Jacobi's name is probably best known to undergraduates from the Jacobian, an n×n determinant formed from a set of n functions in n unknowns. Jacobi was certainly not the first to use it; the "Jacobian" already appears in an 1815 paper of Cauchy. But Jacobi did write a long memoir about it in 1841, and proved that the Jacobian of n functions vanishes if and only if the functions are related (Cauchy had only proved the "if" part). Jacobi also did important work on partial differential equations and their application to physics. Along with Hamilton, he developed an approach to mechanics based on generalized coordinates. In this approach, the total energy of a mechanical system is represented as a function of generalized coordinates and corresponding generalized momenta; for example, in a double pendulum the two generalized coordinates could be two angles. Hamilton-Jacobi theory is the technique of solving the system by transforming coordinates so that the transformed coordinates and momenta are constants. Jacobi was appointed to a position at the University of Königsberg in 1826. He gained a reputation as a gifted teacher and is credited with introducing the seminar method (giving lectures on his own ongoing research) into the university. After a collapse from overwork in 1843, Jacobi was allowed to stay in Berlin with a generous allowance from the King of Prussia. Five years later revolution swept Europe and Jacobi was persuaded to run for parliament. This proved a disaster; not only wasn't he elected, but his foray into politics annoyed his royal patron, who cut off his pension. Jacobi, with a large family to support, was faced with destitution. Only his reputation as the greatest German mathematician next to Gauss saved him; faced with the prospect of losing Jacobi to the University of Vienna, the King was prevailed upon to restore the pension. Jacobi was a notoriously hard worker, and several times had breakdowns due to overwork. But his death in 1851 was the result of smallpox.